I'm trying this at the brewery. It poured an opaque dark with ecru ring head that is not leaving any lace. The scent had earthy and roast notes. The taste had faint molasses with roast highlights. The mouthfeel was very light with subtle carbonation. Overall it's an ok beer. Enjoying from a 12 oz. can in the Huntsville airport. This is pretty good. It kind of surprised me. Not anything crazy, but just solid. Chocolate and oat like with some nice hop presence that I enjoy. Got in a trade with The-Adjunct-Hippie. 12 ounce can into pint glass, canned on 3/19/2018. Pours slightly hazy very dark brown color wiht a 2 finger fairly dense and rocky khaki head with fantastic retention, that reduces to a nice cap that lasts. Nice dense soapy lacing clings on the glass, with a moderate amount of streaming carbonation retaining the cap. Fantastic appearance. Aromas of big milk/dark chocolate, cocoa, caramel, brown sugar, toasted oats, nuttiness, and dark/brown bread; with lighter notes of coffee, toffee, molasses, dark fruit, smoke, char, herbal, grass, pepper, and yeast/roast/toasted earthiness. Damn nice aromas with great balance and complexity of dark/roast/bready malts and light earthy hop/fruity yeast notes; with great strength. Taste of big milk/dark chocolate, cocoa, caramel, brown sugar, toasted oats, nuttiness, and dark/brown bread; with lighter notes of coffee, toffee, molasses, dark fruit, smoke, char, herbal, grass, pepper, and yeast/roast/toasted earthiness. Light herbal/grassy/spicy hop and roast/char bitterness on the finish. Lingering notes of milk/dark chocolate, cocoa, caramel, brown sugar, toasted oats, nuttiness, dark/brown bread, coffee, toffee, smoke, char, herbal, grass, pepper, and roast/toasted earthiness on the finish for a good bit. Great complexity, robustness, and balance of dark/roast/bready malts and light earthy hop/fruity yeast flavors; with a great roast/hop bitter/sweet balance; and no acrid/astringent flavors after the finish. Lightly increasing dryness from lingering hop/char bitterness. Medium carbonation and body; with a very smooth, creamy/silky/bready/grainy, and lightly sticky/chalky mouthfeel that is great. Minimal warming alcohol for 6%. Overall this is an excellent American porter! All around great complexity, robustness, and balance of dark/roast/bready malts and light earthy hop/fruity yeast flavors; very smooth and easy to drink with the mildly bitter/drying finish. Not overly roasty/charred. Very rich and well rounded porter malt complexity; balancing earthy hops and mild fruity yeast. A very enjoyable offering, and spot on style example. 12 oz can poured into Funky Buddha snifter. Silky black shiny body with a creamy bubbly cap of khaki, 1 finger tall. Nice loops of lace as the head recedes. Grainy aromas of Maris Otter and a clean cut of roasted barley. The malt bill on this is incredibly simple and straight forward. Maybe a hint of dark chocolate malt. Hints of cocoa, milk, and oats. Slight metallic presence. Flavor is much like the nose. Grainy, roasted, quite peppery, slightly metallic, with hints of dark chocolate and milky sweetness. Some far off nutty flavors can be sampled as well. Feel is creamy but leaves an undesirable starchy feeling on the palate. Nice mild-moderate carbonation level. 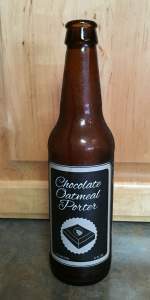 Overall, the Chocolate Oatmeal Porter is one to check out if you're curious. For me it didn't blow my socks off and is about the same as any regional year-round porter. This pours like a melted chocolate bar. Silky smooth, the deepest brown with clean hazelnut highlights, and a frothy dark tan foam on top. A very nutty aroma is met by dark chocolate, extra toasted bread, and mineral water. The flavor is overall quite sweet. Molasses, brown sugar, and chocolate steal the show. The mineral aspect in the aroma is very present in the finish. This seems exceptionally dry and spritzy. As mentioned before, it's on the sweet side, but does have a decent roasty balance. Overall, this is a decent porter. Perhaps a revisit is necessary, but this is not a beer that I would go seeking out again. Cheers. Black pour with a brown head. Sweet chocolate aroma. Taste has a nice combination of chocolate, roasted malt, lactose and cocoa powder flavors. Medium bodied and finishes with a sweet chocolate flavor. Pours a very dark brown colour. Roasty oaty, slightly sweet chocolate malt, slightly bitter nose, and notes of bourbon vanilla. Smooth and rich, tastes like bittersweet chocolate, mocha, dutch processed cocoa, and a dry, light roasty finish. Medium bodied, carbonated well. A straightforward porter. From the 12 oz can in a snifter via a friend from work---Thanks Randy! off white foam that settles to a thin ring, subtle pool, and shows no lacing. Nose of rich chocolate, cola notes, subtle cream, and light char with mild oats. Poured from bottle into a pint glass. Dark sludgy brown, I didn't get any head (insert joke). Got a good strong chocolate smell, but didn't get much chocolate flavor. Kinda reminded me of a smooth brown ale. Very carbonated. Pretty good beer, but nothing that really stands out in my opinion. This is a good, solid beer. Not an over the top one but truly worth it.